The Crius SE 2.5 flight controller board (HCRECO0001) is based and comes pre-programmed with the open source MultiWii flight controller system. This board is able to control various radio control aircraft including quad, hex, and octocopter designs. Its excellent stability allows for fully autonomous flight with FPV or any kind acrobatics. The board includes a broad array of sensors consisting of a triple axis accelerometer, triple axis gyroscope, triple axis magnetometer (compass), and a barometer. Header pins for allow convenient interface to an RC receiver, ESC's, and servo's. Additionally there are also serial and I2C interfaces to allow add-ons such as FTDI USB interface, Bluetooth, GPS*, and OLED/LCD displays. The board is also fully compatible with the MultiWii configuration software and Android MultiWii Ez app (via Bluetooth) providing wireless monitoring and control in flight. Does this board come pre-loaded with firmware? Yes it comes pre-loaded and configured for a standard quadcopter but you may need to reprogram the board should you wish to update the firmware or reconfigure the software for a different type of aircraft or external hardware. What do I need to update the firmware? Where can I find the latest version of the MultiWii software? At the time of this post the latest version tested with this board is V2.3. The downloaded ZIP file contains two folders, MultiWii, and MultiWiiConf. The MultiWii folder contains the main MultiWii.Ino file which can be loaded into the Arduino development environment (see above). In the Arduino environment what board type do I select? How do I configure the MultiWii software for the Cirus SE 2.5 flight controller board? Also as a minimum configuration you will also need to uncomment one of the lines in the 'type of multicopter' list to select your aircraft type. Can the Crius be used to control a fixed wing plane, if it can does the pr-installed firmware support this or is there a upgrade firmware for fixed wing use. The MultiWii firmware does support fixed wing aircraft including flying wings. 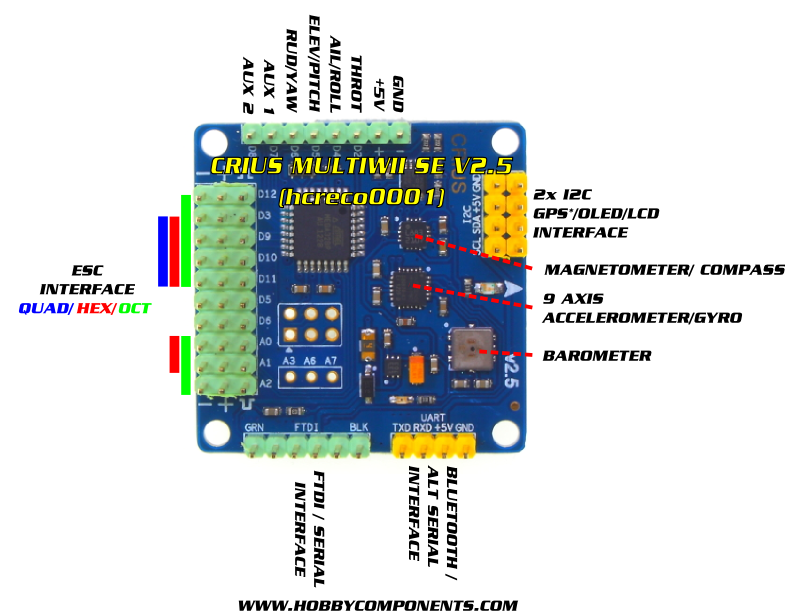 However out of the box this board is setup for multi-rotor aircraft so you'll need to edit the firmware to configure it for fix wing aircraft and then reprogram the board. Working from memory I believe there are selectable options for this in the config file. You may want to follow the link in the first post to download the firmware and take a look at this file in a text editor to see if you understand it. To reprogram the board you will need a USB to serial adaptor.